A Single Drop and UNYPAD create a community-based water organization (Water PODS) to design, install and maintain self-sustaining community water system for Northern Kabuntalan in the ARMM Provinces. The Autonomous Region of Muslim Mindanao (ARMM) is the poorest region in the Philippines. Ongoing conflict and natural disasters have plagued the region for decades. Maguindanao, one of the five provinces that broke away from the Republic of the Philippines has suffered from the conflict. Northern Kabuntalan, is a new municipality in Magunidanao and was created in 2006 as it split from Kabuntalan. This was done because of its geographical isolation from the municipal capitol. It is made up of 11 barangays (villages) and is one of the more marginalized areas in the province of Maguindanao. It is a plain area traversed by several rivers including the Rio Grande de Mindanao. It is subjected to flooding and is an agricultural community. All of the residents water supplies are from unimproved water supplies, mostly unprotected shallow wells. 67% of the residents have either open pit or no access to sanitation services. As of 2007 total population is 22,170 people, spread throughout the 11 barangays. Indatuan is one of the isolated barangays within the Municipality with 360 residents. The Municipal Local Government Unit (MLGU) along with the Barangay Local Government Units (BLGU) focus more on increasing agricultural output and poverty reduction. Water receives little budget because they have little capacity to service this demand. Sanitation is not prioritized. There are 60 households in this community. however, there is a plan for scale up and this will include the Sanitation. Also, the whole community will receive WASH Education and learning materials. 15 members of the community will create a Water PODS to maintain and manage their own water system. 10 UNYPAD youth will have hands-on real life experience in the implementation and management of water projects and create community-led water organizations. Access to safe water by all citizens is a basic human right and provision of safe water is the responsibility of the LGUs. Due to overstretched financial resources and lack of qualified technicians, civil society must be engaged and empowered technologically to alleviate the stress. The presence of a local hub for water resource expertise or Water PODS (People Offering Deliverable Services) must be stable, sustainable and run by its own citizens. This project is focused on technology implementation and the creation of a local Water PODS in Indatuan, Northern Kabuntalan that can manage and maintain a fee-based water service project to ensure community ownership and self-reliance. The water system will protect and develop the artesian well and pipe water approximately 350 meters to a small ferro cement storage tank (3,000liters) with multiple tapstands close to the tank and would supply 60 households (360 people). A Single Drop for SafeWater and United Youth for Peace And Development (UNYPAD) will build the capacity of the barangay (village) members to build and maintain the water system. The community members will work together to build the tank, dig the trenches and lay pipe. 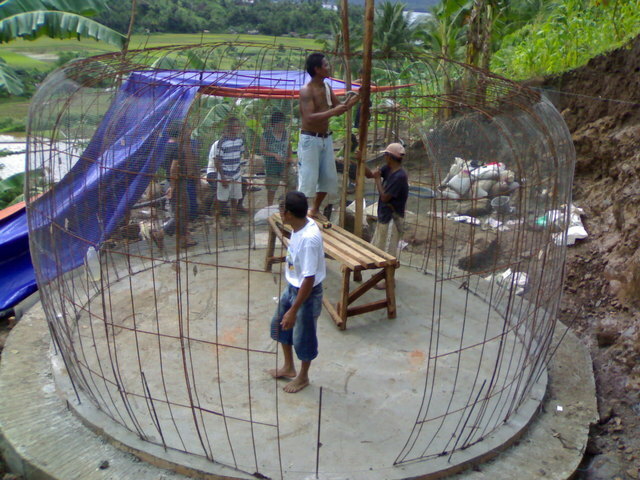 Members of the Water PODS and UNYPAD, through hands-on training, will build the ferro cement tank and install the pipes and tapstands. Also low cost water testing will be introduced for the testing of biological contamination during the WIn process. It will be institutionalized to monitor water sources. ASDSW through mentorship of UNYPAD will help mobilize community leaders in and members in Indatuan who will be members of the Water PODS. They will undergo an intensive organizational and business development training that will result in the formation of a fee-based water service project that is community owned and managed, with local government support. PODS members will develop a sustainable community service with affordable fee structures, design and conduct customized WASH Education campaigns, conduct regular water tests, maintain and manage their own community water system, and create a 3-year WASH Plan. The PODS will have the foundation of a water service organization that can scale up their services in the near future, i.e. implementation of sanitation and toilets etc. ASDSW creates Water PODS (People Offering Deliverable Services) all over the Philippines. Currently, there are 15 Water PODS in the Philippines offering services including, fee based community water systems and biosand water filter micro-businesses. 100% are registered associations in the Philippines and have implemented technologies. Three of four of the water system PODS are fully implemented and collecting fees. More than half the BSF PODS are income-generating and one of the nine BSF PODS are conducting technology trainings. We work at two levels; Local Water PODS and Regional Water PODS. Building capacity at the local and regional level fosters local expertise, ensures cultural appropriateness and supports community ownership through demand driven strategies. Local Water PODS: We work at the local level with villages to create Water PODS who partner with the BLGU that implement and maintain a water service/business in their communities. Regional Water PODS: And on another level, we work with the MLGU and Peoples Organizations as well as local Non-Profit Organizations to build their capacity to create local Water PODS. This project implementation builds the capacity of both the Local Water PODS in Indatuan and Regional Water PODS in North Kabuntalan. The local PODS will offer a sustainable water service in their community. Through this project, both UNYPAD and Indatuan will have increased capacity to implement water projects and UNYPAD can have the ability to replicate the local Water PODS program in the surrounding Northern Kabuntalan Municipality. A Single Drop for SafeWater (ASDSW), formed by A Single Drop, will be spearheading the project. The project is designed to have the local PODS to plan and implement their own project from start to finish with ASDSW supervision and management. So community ownership is assured from the beginning. The Phases indicated in this program support a more expansive program that also builds capacity of the Municipal level WASH Task Force (MWTF). This project is a pilot program using Barangay Indatuan and UNYPAD to create a replicable model to be implemented Municipal-wide by UNYPAD, MWTFs and other local NGOs. We have included it to indicate the breadth of the program, how the Indatuan PODS fits into the municipal plan, as well as how the model will be replicated municipality wide. Phase 1 - Formation of a Municipal WASH Task Force (MWTF) by Executive Order. This body is made up of officials from the LGU to focus on all WASH projects in the municipality as a whole. Phase 2: Formation of an Interim Water and Sanitation Association (WSA) in a target barangay (Indatuan) to implement, administer and operate WASH services in the community. This is a peoples organization from the community that partners with the MWTF in providing these services. This would be done through a General Assembly of community members. Phase 3: Using Barangay Indatuan as a pilot barangay a WASH Inventory (WIn) will be done. This is a combination of household interviews, Focal Group Dialogues and ocular inspections to determine the situation and resources available as well as issues that will affect sustainability of the program. This is done by the MWTF and WSA facilitated by ASDSW and UNYPAD. Both bodies will be given on the job training so it can be replicated in other barangays to form an overall WASH Situationer and resource map. Phase 6: PODS Training and Organizational Development which includes visioning, business planning, accounting, WASH education and outreach, social marketing, technology maintenance, organizational management, and organization registration. Phase 8: ASDSW/UNYPAD follows up with M&E and will continually monitor the progress of the Indatuan PODS and assist where needed. As the members of the Water PODS are mobilized, LGU officials are always engaged and included in the program. It is crucial for a project such as this, which is offering services that by right, should be offered by the LGU, have political will behind it to ensure success. LGU officials will have positions in the PODS, but not hold a voting majority in the decision-making. An MOU between the local PODS and LGU will guarantee the recognition of the PODS to be the decision-making and management entity of the water service project. This strategy also fosters a working relationship between the PODS and the LGU. The PODS will work with the LGU to allocate more funding towards future Wat/San development as laid out in the WASH Plan that was developed at the beginning of this process. We have seen that through this process in our other PODS, more LGUs have begun to redirect their government funding towards WASH Projects because of the success of the implementation of a water service and the organization's capacity to maintain it. As mentioned above, ASDSW will be working with UNYPAD to build their capacity as trainers and implementers as well as community organizers. Our goal is to support their development as a Regional Water PODS that can act as consultants and trainers in their region, hired by their local governments to become self-reliant. Members of the local Water PODS will gain skills in business development, WASH education as social marketing, vocational activities and technology implementation. Under the supervision and guidance of ASDSW, United Youth for Peace And Development (UNYPAD) is a local organization for the implementation of various programs. the households will pay a monthly fee to access the water which will cover maintenance and admin fees. Hi, thanks for this application. Can you brief us a bit on possible threats to infrastructure by political unrest in the project region? thanks for this application. Can you brief us a bit on possible threats to infrastructure by political unrest in the project region? Great to connect. As far as the region and political infrastructure, there is always a risk. That region has sporadic bouts of conflicts and yes, it is a difficult thing to navigate. Usually, much of the threats to getting started or moving forward is during the elections. Nothing gets done during the elections, and if they do get started, if there is a new administration coming in, then there is always risk that the project may be stalled. The way we alleviate that is that all the MWTFs and WSAs come up with a municipal strategy that becomes an official declaration for a WASH municipal wide program and so have better chances of not be affected by elections. Eventually PODS, will have government officials in the organization. The government officials who are involved however, are not elected officials, so usually are not effected by elections, like the Sanitary Inspectors. Also, when violent outbreaks happen at other times, there can be some chances of postponement of projects, but unlikely cancellation of them. There is much interest in providing affordable and viable water services, so communities, if they endure an obstacle, will often regroup when the conflict ceases. However, UNYPAD and the people are quite resilient and used to living with such challenges and just moving forward where they can. Water has great potential to be a unifying force in the communities. Our goal is to have the government accept higher standards for WASH services and have more funds be directed towards these projects. Just a few questions Gemma, since the approach seems to be close to what PROTOS tries to do in some African and Latin-american countries: create capacities at local and regional level for community managed water systems, while emphasising the complementary roles of civil society and local government with respect to local basic and public services. Is UNYPAD the Regional Water POD for North Kabuntalan ? Or is UNYPAD rather your counterpart in setting up the regional POD's ? Is UNYPAD working in other sectors also ? And what is their relationship with the local POD's ? I can imagine that the local POD's will need a support on the longer run for more sophisticated interventions; is the idea that the regional POD should give this support ? If so, is there any organisational link or mechanism for accountability between local and regional POD's ? You're talking about 15 existing POD's all over the country. Any statistic information, evaluation reports or so on this experience ? What about the ownership of the water systems ? Officially, I understand that LGU is responsible for water supply - and also the official owner of the assets ? Do you plan also any mechnism of "local auditing" ? What about the longer term savings for rehabilitation and renewals ? Our experience shows that it's rather easy to get people contribute for operation and short term maintenance, but savings in the community for the replacement of a pump in another 7 years is not so easy - and one of the reasons seems to be the rather unofficial status of the water committee. Any data or approach with respect to this blottleneck in the PODS-scheme ? Very excited about sharing our insights about community water service models! UNYPAD is being mentored to become a Regional POD. It is an existing organization that also works in education and livelihood. ASD and UNYPAD will be helping to create the local PODS where eventually, they will be the local NGO that will continue the technical, organizational and development support when needed by the local PODS. ASD will continue ongoing mentorship with UNYPAD to transfer additional water technologies as well as build their skills and confidence in developing and supporting Local PODS on their own. Ultimately, ASD will have a competency validation standard that will create the accountability mechanism for the relationship between both the national PODS (ADSSW) and regional PODS and the local PODS as both the National and regional PODS have the capacity to develop local PODS. this will be acquired through several consolidation strategies for continual monitoring and recording all learnings and milestones. Currently the exisiting PODS are all in different stages of development. Some were developed before the WiN/WASH Analysis was integrated. We have found that the most successful and the ones that have moved forward and upscaled quickly are those that went through the process of the WIN/WASH because they made their own decisions as opposed to the decisions being made by the funders. We are currently being considered for a research grant that will help us to do a comprehensive survey on the impacts of community-led water service projects. We will be looking into the obvious, health impacts, reduction of disease, but are also interested in researching the change in government WASH funding. Actually, ownership of the water has not been the issue. It's more a question of who is managing the system. The government as well as the community acknowledge that the local PODS are the stewards of the system, and the water is by right, available for the entire community's benefit, and that the fee they are paying is for the service of the water closer to their homes. One of the PODS officers is an internal auditor. There are also collectors, a treasurer, bookkeeper. As part of the PODS organizational development workshop, the PODS establish a business plan that creates a cost structure that will have 25% of it's fees go to a savings for upscaling their project or creating another community development project. Also, another 25% goes towards an incentive program that basically ensures that each member has shares in the system. The organization is SEC registered and there is an MOU that is signed by the PODS and the local government recognizing that the PODS is the official management of the water system. Two of our projects, (one of which united 2 barangays (villages)) developed a spring and built a Level II water system, which basically means there are communal tap stands. in less than a year, about 3% of their users have already upscaled to a Level III water system, which has piped water from those tapstands into multiple homes. This is an example of how some have used their shares and paid extra to upscale their systems from Level II to Level III. Would welcome your opinion and insight anytime! This is an exciting application since its implementation will evolve as the people make decisions. I hope some sanitation makes it into the project. My concern is the lack of frequent reporting. It would be great to see decisions made being reported as well as meetings and strategies. PWX has a really simple reporting system that allows the collection, documentation and sharing of a project implementation history. Having seen earlier project reports by ASD i am concerned that this opportunity may be missed. This application could be rated by the earlier work, but since the reports are scant or missing, it has to be rated without history, so its not as strong. Who knows, they may actually choose to implement toilets immediately afterwards or simultaneously! It'll be entirely up to them. Plus with the costing structure we encourage them to develop, they will have a surplus after a few years to implement a different project. Yes, I do agree we have been not as diligent in keeping regular reports, but I'm not sure if you noticed that we completed our report for the Mozambique project since Mariah has returned. I did notice the report. Thank you. Am more interested in seeing how our incremental reporting system will be used. Not that every meeting has to be documented necessarily, but it can! We would at least like to see important milestones noted and a history/progress built. Very few members of PWX are using this feature and i look to a few of you active ones to take the lead. I like the idea of focussing on training, sensitization and capacity building while at the same time creating infrastructure. Budget and narrative seem to reflect this quite well. I support the proposal for funding. Maybe some more low-cost techniques of water purification and treatment would be interesting add-ons for the training - otherwise only the target communities for infrastructure projects will take the trainings really serious. All the Best! This project works on community mobilization and organizing local capabilities for a community based management of the water services. That's a good approach. On the other hand, I don't see a good link with local government and institutional questions. Water supply is a public service and authorities have to take their responsability. Even if they are not really interested or mobilized today, each of our projects should work on that willingness and capacity also - I miss this component a bit in the proposal. But still an interesting project ! This project should be successful whether or not it delivers water as planned. It should be seen also on the criteria of developing local leadership skills. And how it works with the gov't and how the model spreads. But those are hard criteria to measure success again, and due to lack of history its hard to know how ASD will succeed in delivering this project. However, the implementers need to figure out how to use PWX's simple reporting mechanism to show all the twists and turns this community takes on its way to safe water. Congratulations for a very good proposal and to consider the vital needs of the community. It is understood from the project proposal that an autonomous region ARMM is the poorest region in the Philippines suffering from ongoing conflict and natural disasters. The village community do not have access to safe potable water. This project aims to establish PODS for drinking water project that can manage and maintain by the people through regular collection of water tax. Conduct regular water test, maintain and manage their own community water system with the creation of 3 years WASH plan. Simultaneously, motivating the village community for the promotion of toilets and sanitation facility, once the drinking water problem is solved. The project is well designed with inbuilt capacity building of different stakeholders as well as also ensure the ownership of the community aiming to create replicable model to be implemented municipal wide through the Govt. funds. Though the person cost works out to 29.79 $ is worth while considering the situation and the drinking water problem.